One of the oldest cities in the US, Boston, is the capital and the largest one in the state of Massachusetts. Founded in 1630, this historic city has many iconic buildings constructed in the mid-twentieth century. It is also home to the Trinity Church built in 1877. 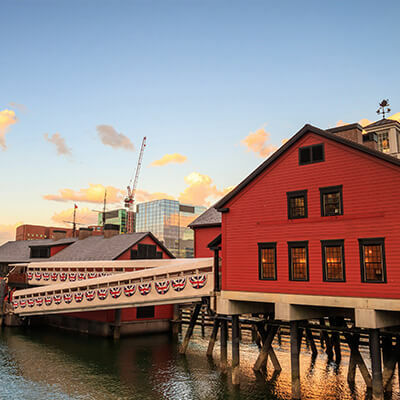 Get your cheap plane tickets to Boston and marvel in the city’s heritage. A gorgeous city with a lively nightlife, its famous sea-food cuisine is to die for. Don’t forget to try the New England clam chowder, lobster, steamed clams and fried clams while you’re there. Let your hair down and drop-in at one of the nightclubs for an evening of dancing drinking fun. A few you might consider are House of Blues, Venu, Royale and The Estate. Museum of Fine Arts- The fourth largest museum in the US, its art collection consists of more than 450,000 pieces. One important feature of this museum is that it maintains one of the largest online databases in the world. Its exhibits portray the heritage of many different cultures by showcasing paintings and artifacts unique to them. Egyptian sculptures & jewelry, Chinese paintings and calligraphy and Japanese pottery are only a few of the pieces they have on display. Freedom Trail- Located at downtown Boston, it is a 2.5 mile long path passing by 16 historically significant sites. These sites include Churches, graveyards, old buildings and a naval frigate. Boston Common- Another gem located at downtown Boston, it is a lush green urban park. It also holds the record of being the oldest city park in the US. New England Aquarium- The aquarium has around 22,000 residents of different species including Sharks, Penguins and Turtles. Museum of Science- Considered to be a landmark, the museum has around 700 interactive exhibits. This provides a fun hands-on learning experience to its visitors. It also features many educational live-presentations held throughout the building. Whether you’re someone who’s organized and plans everything well-in advance or a free spirit searching for last minute flights to Boston, Lookupfare has the best flight deals to meet the demands of its diverse clientele. Their dedicated team uses the latest technology in the industry to bring you the travel package which caters to all your travel needs. Browse Lookupfare’s website and app to find cheap airline tickets to Boston and have a fun holiday. If your return date has not yet been decided, you may choose one of their lucrative one way flight deals.